76 Flowlines were sold and installed between 2000 and 2006. An extremely versatile Sawing & Prepping Centre designed specifically for British window systems. All possible requirements of sawing & prepping required can be carried out on this machine including ninety degree, forty five degree and arrowhead saw cuts, ‘V’ and ‘Y’ notches, trickle vents, drainage, espag prep, all door preps and much more. The Flowline is designed to remove as much skill and labour from the beginning of the production line as possible and it is the ideal machine for this. Three hundred and sixty degree rotary tooling system allows for unlimited machining possibilities. 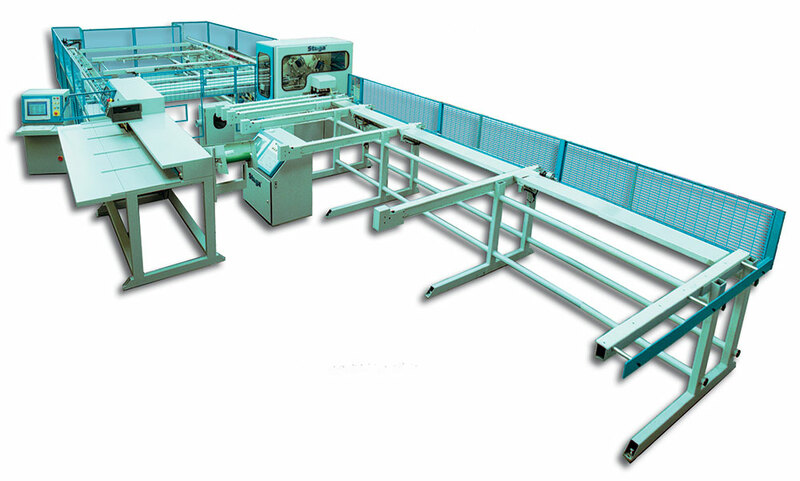 Separate sawing and machining modules working in tandem preclude delays caused by saw waiting for machine or vice versa. See the About Us/News page for more details on Flowlines, the most sought after used sawing & maching centre in the market place!